Translites are thin, flexible plastic sheets that fit into the lighted recesses often seen above fast food counters. Burger King issued them for all three of the Star Wars films in the '70s and '80s, this one being the ROTJ version. 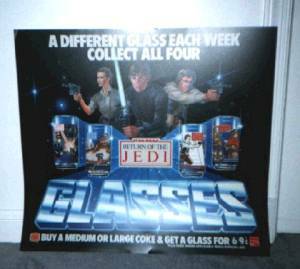 I really like the artwork on this particular design, which finds its counterpart in Burger King's ROTJ hanging display.